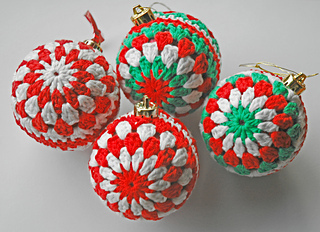 Free pattern for Boho Christmas Crochet Baubles! I made mine in a Sportsweight weight yarn – Scheepjes Catona and 3mm crochet hook. 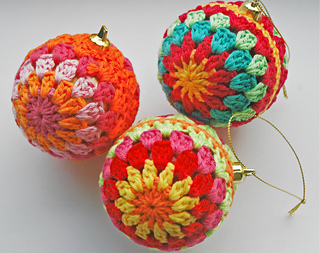 You could also use a DK weight yarn but you may need to leave out round 5…..experiment and fit on your bauble as you go, and you will soon find what’s perfect for you. 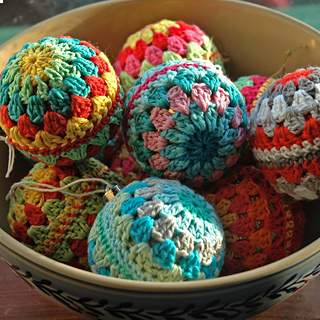 If you use a 4 ply weight yarn, you may need to repeat row 6 once or twice more, to make your crochet piece large enough to fit your bauble. Try it on as you go remembering that it needs to be a tight fit. You can easily stretch the 2 pieces as you sew them together! You will have a better fit if your final piece is slightly smaller than your bauble….as you stretch it will settle into place and give you a nice firm decoration. Make loads in all your favourite colours! They make lovely Holiday gifts – just add them to a box with some tissue paper.